Photograph 1 - The back end of a B52. 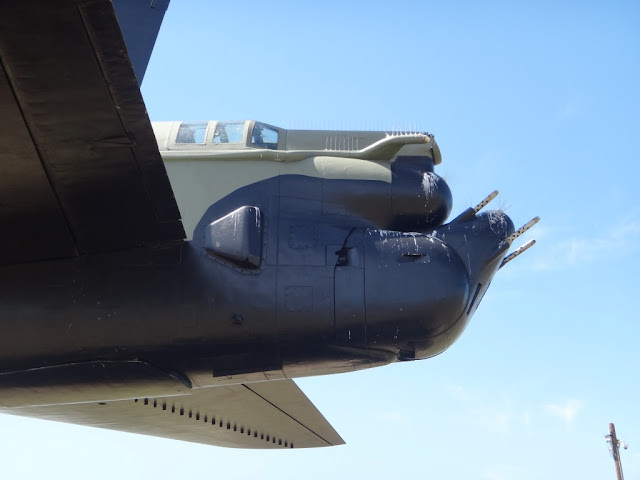 This is an old model "Buff" because there is a position for a tail gunner. Later B52 models were/are have/had radar control rear guns. 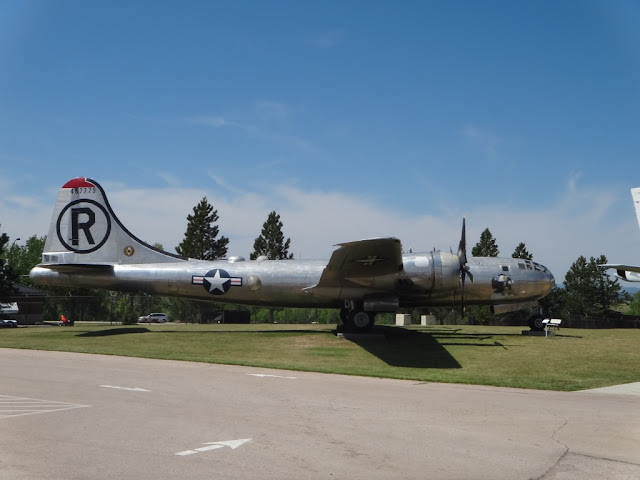 Taken at Ellsworth Air Force base, Rapid City, South Dakota. 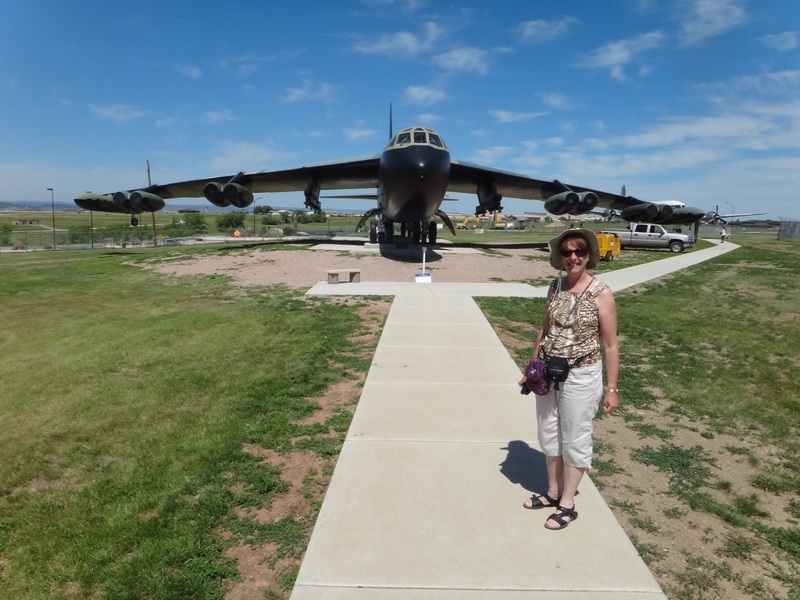 Photograph 2 - Anne in front of a B52D "Stratofortress, Ellsworth Air Force Base, Rapid City, South Dakota. 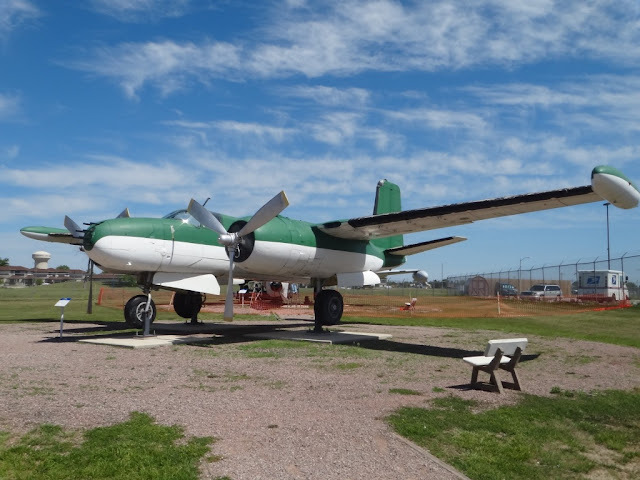 Photograph 3 - A rare aircraft, a B26K "Invader", Ellsworth Air Force Base. 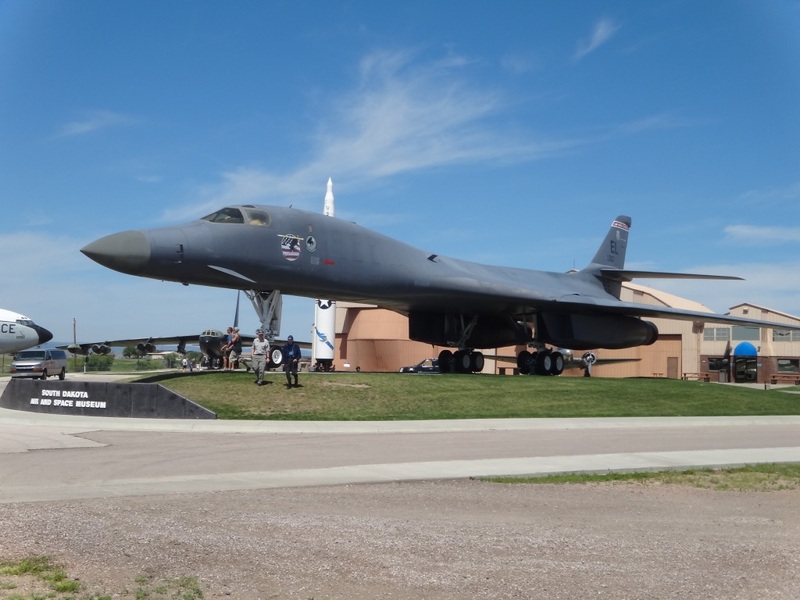 Photograph 4 - A B1B "Lancer" bomber, flew many sorties over Iraq during Gulf War 1, Ellsworth Air Force Base. Photograph 5 - A B29 Superfortress, same type of aircraft that dropped the A bombs over two Japanese cities in 1945, Ellsworth Air Force base. 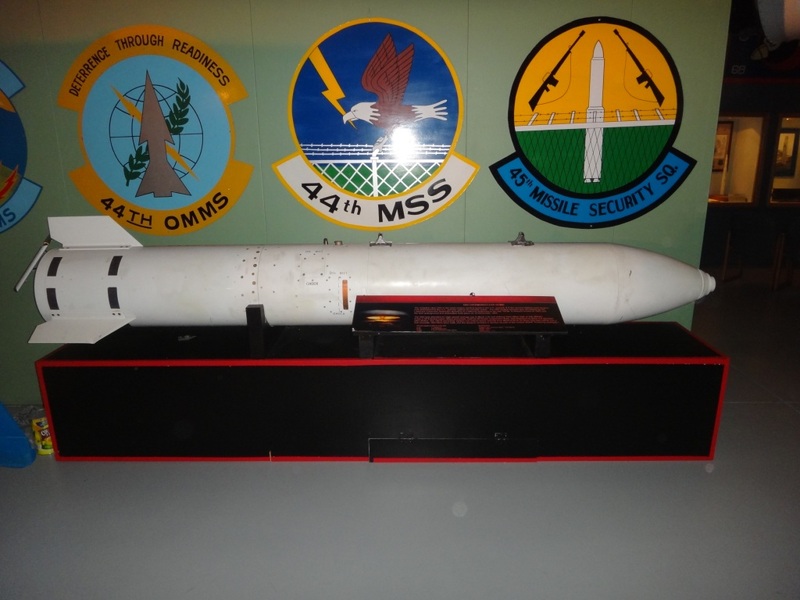 Photograph 6 - This is a nuclear weapon carried by aircraft. It is only a small bomb "1.5K tons" but the length is only 1.5 metres long. Located at the Ellsworth Air Force Base museum. 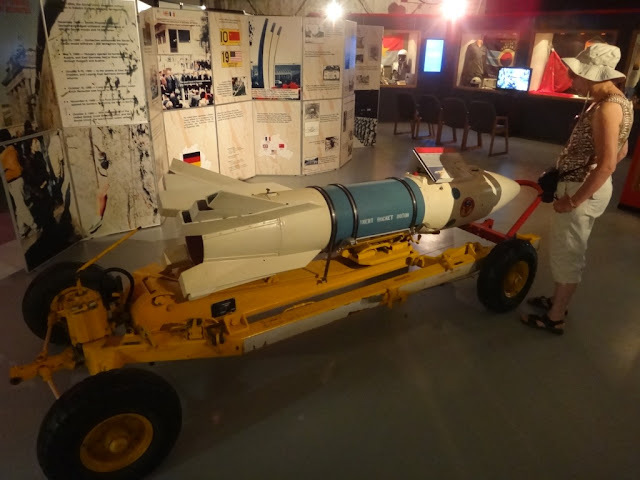 Photograph 7 - This was a surprise - a Genie Bomb. This has not ever been used, thank goodness. Its purpose is to be fired by a fighter jet directed into a squadron of belligerent Russian bombers. The fighter jet had to get out as quick as possible before the nuclear atmospheric weapon detonated. Its aim was to destroy all incoming bombers in one go whilst in flight - crazy thinking!! Taken at Ellsworth Air Force Base museum. 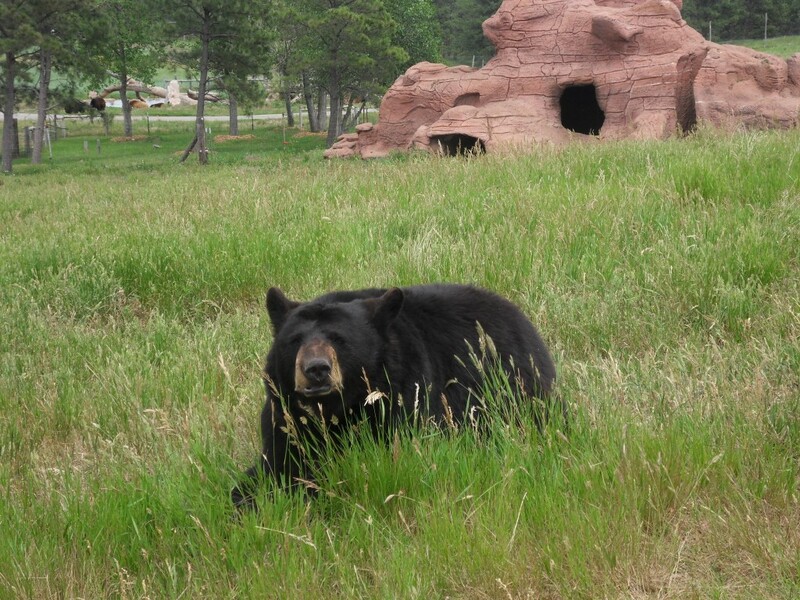 Photograph 8 - A black bear (not in the wild) taken at Bear Park, Rapid City, South Dakota. 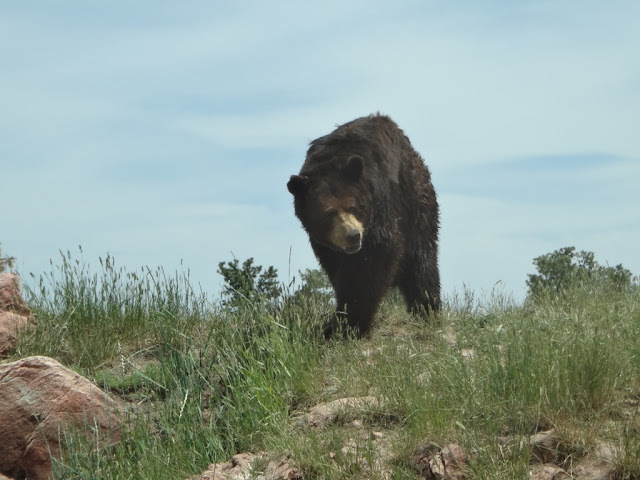 Photograph 9 - A grizzly bear (not in the wild) taken at Bear Park, Rapid City, South Dakota. 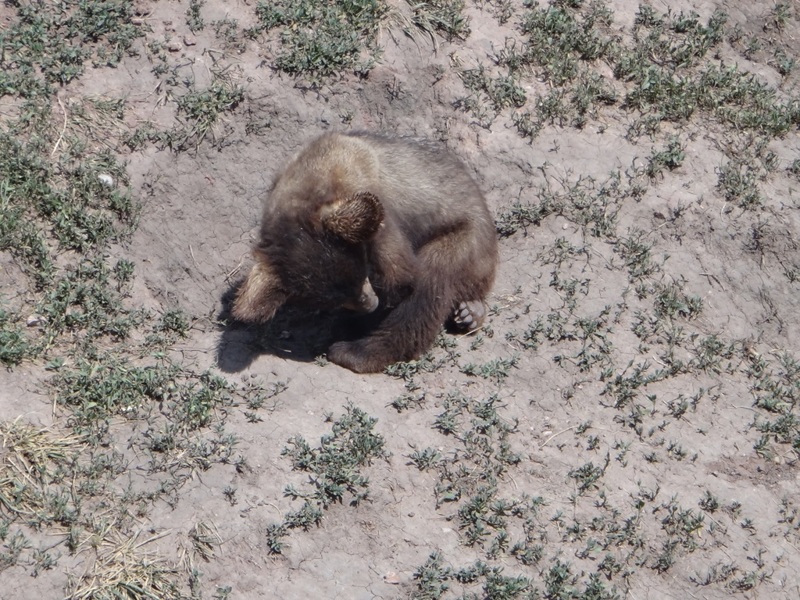 Photograph 10 - A Bear cub taken at Bear Park, Rapid City, South Dakota. Photograph 12 - A small engine taking us back to Hill City, Black Hills of Dakota. 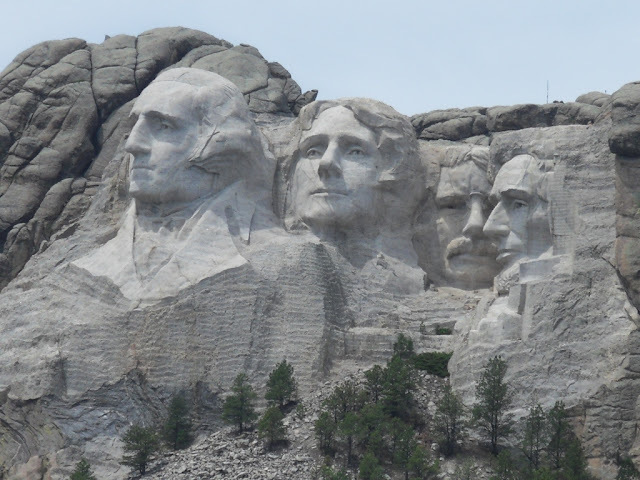 Photograph 13 - What can we say - an excellent photo of the Mount Rushmore Monument, South Dakota. Photograph 14 - Ahhh, if it feels good - do it. Back-rubbing in Bear Park, Rapid City, South Dakota. Photograph 15 - "Am I a grizzly or a polar bear"? 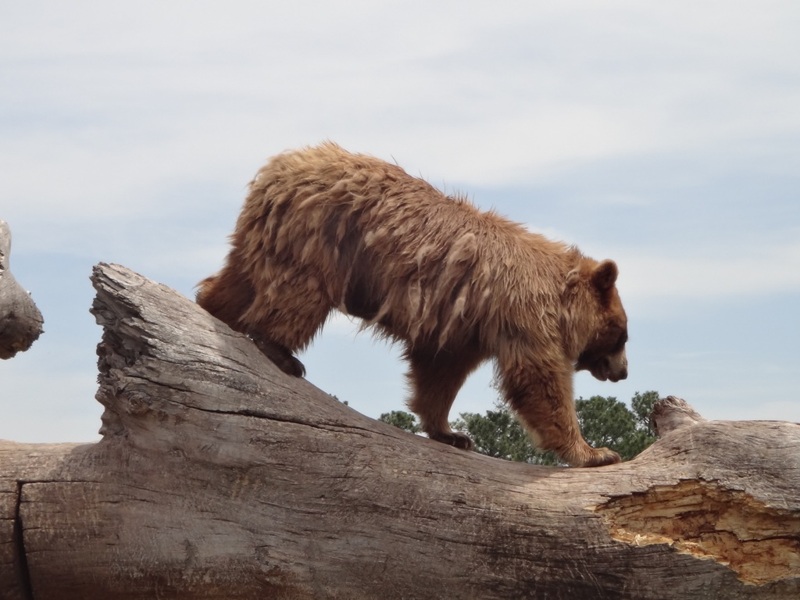 "If I am a grizzly why am I'm so cold"! 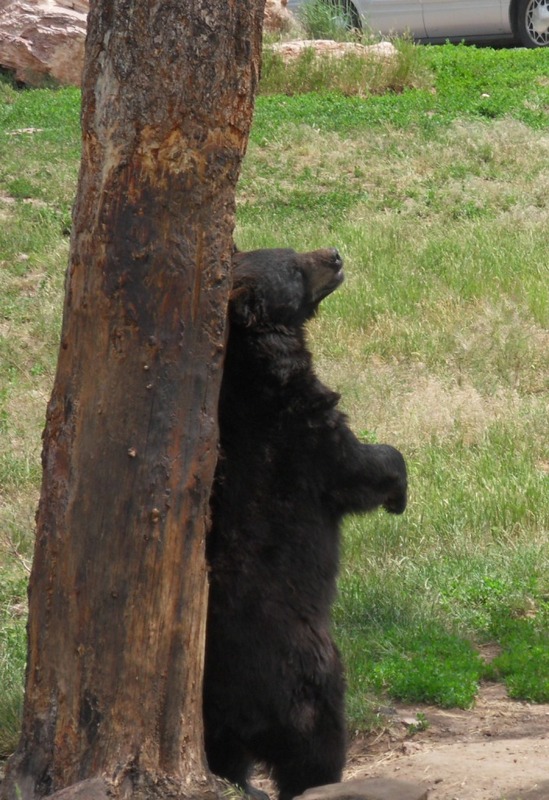 Bear Park, Rapid City. Photograph 16 - "I hope you have that car window closed, because I can smell a pic-a-nic basket" Bear Park Rapid City, South Dakota. 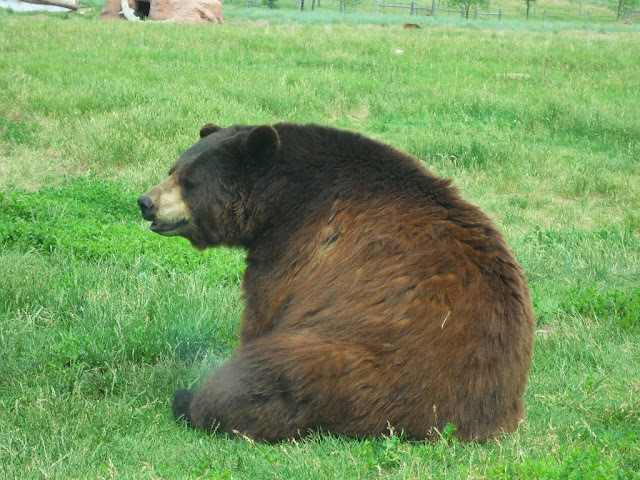 We saw more bears today..........in a Bear Park! Basically it was a rest day for our Connie. We only drove her to Rapid City to stop at Wal-Mart to buy some goodies and whilst we were in locality we stopped at Ellsworth Air Force Base to the free museum and exhibits. There are 29 aircraft on display ranging from pre-WWII to the B1 bomber and gee it was good for Neil who as a retired Air Force gunnie just about rubbed shoulders with every aircraft. The surprise was located in the museum building. Two nuclear weapons were on display (the business part taken out naturally). The above pictures have a narrative briefly describes these weapons. From Rapid City we visited Mount Rushmore and discovered an excellent photographic site before entering the park (entry fees were $11USD). Also down the road we tried to get a good photo of the Crazy Horse Memorial (actually started in 1948), however, this was a $20USD entry fee but the good toll booth lady allowed us to enter a short distance to take a snap. This effectively saved us $31USD. With a bit of time in hand we drove back to Bear Park at Rapid City and drove around the open roadway to be "in the caged but wild: black and grizzly bears, mountain lions, shorthorn sheep and other docile animals. There was a babyland section that had baby bears in closures. Now while we were looking at these cute little harmless critters, one American dad said to his son "Son, these baby bears are pups". So Neil in his right wisdom tactfully corrected him and said they were cubs. "Right these pups are cubs - heh". Neil wandered off with bottom lip pouted and said no more. After Bear Park we returned to our hotel, put Connie to bed and walked to the Hill City train station. 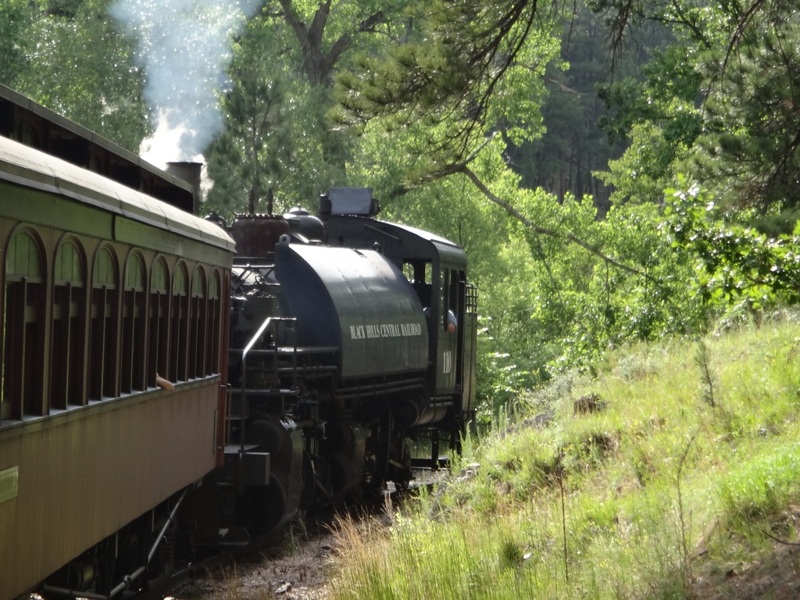 We took the 1880 tourist train to Keystone (at the base of Mount Rushmore). It was good, relaxing and breathing in unburnt coal was actually bringing back nostalgic memories of days of olde. Another interesting statement from another American dad when the locomotive was depressurising steam and had blown water over the opened carriages. "Is that water coming from steam?" "I can't believe that's water coming from steam". I suppose us Ozzies do come up with similar gems like that, but this particular person had to tell all the people in the carriage his discovery. I guess you had to be there. 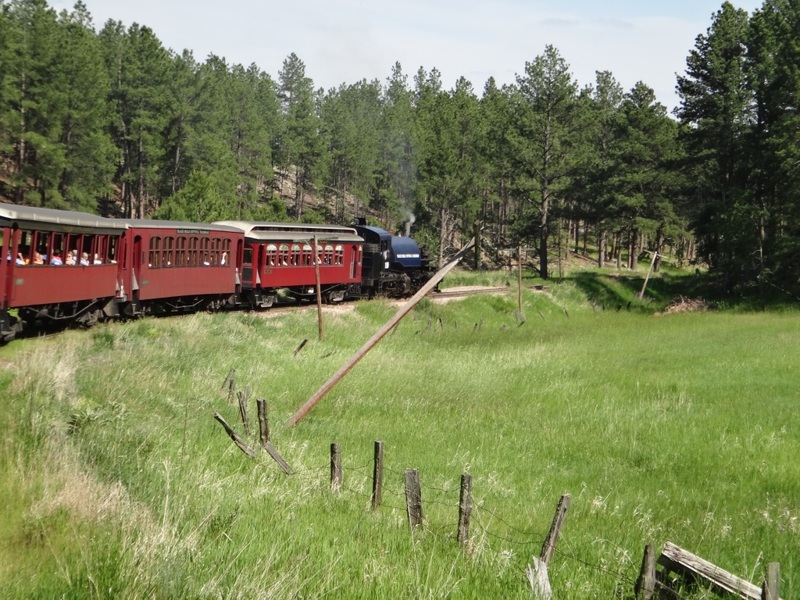 We returned to Hill City at 6pm and for the first time in weeks heard thunder in the Black Hills thar-yonder. It might rain tonight. Tomorrow we leave Hill City, South Dakota and head for Deadwood, hence to Devil's Tower and Custer's last stand at the Little Bighorn. We will be staying overnight in Montana at a place called Bilings. So until then - cheers.